We know you love living in Coogee with its beautiful beach, the awesome selection of restaurants and of course the Coogee Bay Hotel. Now you can rest a little bit easier and enjoy the area even more as your local Coogee locksmith is here to make everything more secure. The beautiful beach of Coogee is nestled in between Bondi and Marounbra and is just down the road from the busy Randwick village. Businesses and residents of Randwick and all Eastern Suburbs locations benefit from the security services offered by Fusion Locksmiths. 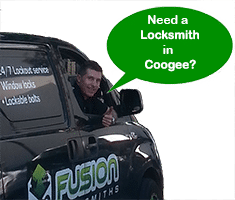 Fusion Locksmiths can supply and fix any type of lock for homes, apartments, businesses and automotive – anything that you need secured. Don’t forget that garden shed out the back with your prized surfboard! Our team of Coogee locksmiths are all licensed, insured and police checked, for that extra peace of mind. Your security is our top priority, to supply, repair, and install all your safety measures around your house and business. We have many solutions for all access points around your home and business, from the front door right through to the back shed! Moving House? Want a Lock Inspection? This is a great time to double check your locks. You don’t know who has a key to your new place, so get Fusion Locksmiths to improve your security. From a simple rekey of your existing locks to installing new modern locks to tighten security, we have a range of locksmiths services to meet every request. With over 9 years’ experience in Coogee and based around the corner, we can get to you really fast in an emergency lock out situation. Of course for anything less urgent you can make an appointment when it is convenient for you. Just call us to speak with a local locksmith.